Jana Oliver’s first novel in the Demon Trapper series, The Demon Trapper’s Daughter, alights on a new twist to an old concept – Good vs. Evil – Heaven vs. Hell with human’s caught in the middle. Though I haven’t been a teen for many years, this genre has always been my favourite and I will gravitate to it before any other. That being said, my thoughts and views on Oliver’s novel come from an adult perspective and should be considered in such context. Overall, I enjoyed following Riley throughout the novel and learning more about the dystopian society of our near future. My favourite character is Denver Beck. He is the strongest character Oliver introduces readers to. His military past, desperate childhood, and current bad habits make you want to knee him in the groin and hug him at the same time. Now that’s a character I can get into. The gritty realism and subtle clues about the man behind the façade are well balanced and masterfully imagined. However, I cannot say the same for the title character – Riley. Often she comes across as scripted and stereotypical, not for a Demon Trapper but for a teen. At the same time my impression of her is closer to the age of 14 or 15 rather than 17 going on 18 – and that’s not an equivalent to her current society standards, it’s an equivalent to today’s standards from the point of view of a high school teacher. Her inner monologue is often over states what has already been implied. With the crap this girl goes through and the crazy ‘new world’ she lives in, a whole new breed of 17 year old should be described. I do not see evidence of this until the last 1/3 of the novel. There are moments in Oliver’s craft that make me aspire to write a line as cognizant and fulfilling. But those are few and far between. Oliver has an amazing story that really doesn’t ramp up until after the half-way marker. I found it easy to put the book down when I had errands to run or meals to make… if I can do that, the writer hasn’t gotten her hooks into me and the story is wallowing. I was disappointed in the level of intensity of the first chapter. After reading the blurb on the back of the book I was psyched up for a thrilling ride that just didn’t follow through. Then, when Riley was alone in her apartment and everything was extremely normal my heart raced and I wondered what was about to break her moment of peace – a grade 2 or 3 fiend waited in the wings of my imagination. I was disappointment I nearly stopped reading. I have invested in the first 4 books of the series just based on the back cover blurb, so I trudged on. While I understand that Oliver is writing for teens, other than the wonderfully ironic use for Sippy-cups, I found an over abundance of ‘trying’ in her craft. That is ‘trying too hard.’ The physical description of many of the fiends borders on absurd, especially with the level ones. They come across as contrite and kitsch in such a way that I was taken out of the story whenever I came across them. I think Oliver could still have had magpies be endearing without going ‘Anime’ on her readers. 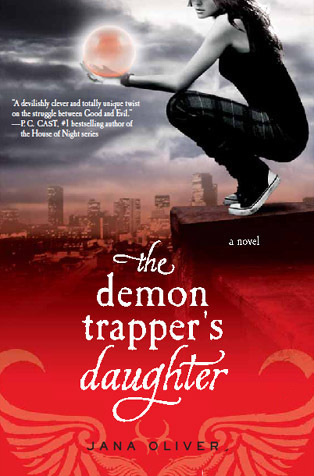 The Demon Trapper’s Daughter is a novel with a lot of promise that doesn’t always live up to expectations. However, with the dramatic improvement in the pacing and character development in the last third of the novel, I look forward to seeing this high level of achievement follow through with the rest of the series.